The place is a good value for money. It is not in the Old Town but some 10-15 min walking, so a bit away from the fuzz. It was quite easy to get there by public transport from the airport. There are some food shops (including Lidl) and cafes around. There was a kitchenette in our room, thus we made our own breakfast. We had a shared bathroom but it was clean and very pleasantly warm (and it was shared only between two rooms). There is nice inner yard/garden. Very peaceful, you don't notice you are in the city centre. Excellent location, excellent cleaning and excellent hospitality... thnx for everything! Very quiet neighborhood close to markets and excellent restaurants. Clean, comfortable, near to the centre, organized. I liked the location as it is around 200 m from Florenc bus station. The apartment was huge and a great value for the money. 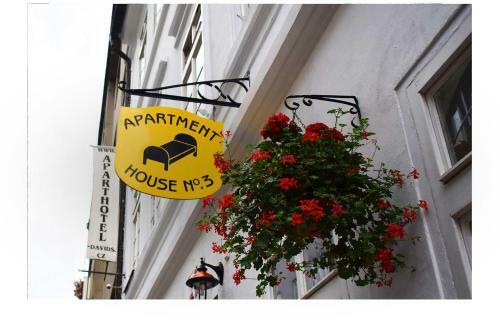 Lock in a great price for Aparthotel Davids – rated 8.7 by recent guests! Aparthotel Davids This rating is a reflection of how the property compares to the industry standard when it comes to price, facilities and services available. It's based on a self-evaluation by the property. Use this rating to help choose your stay! 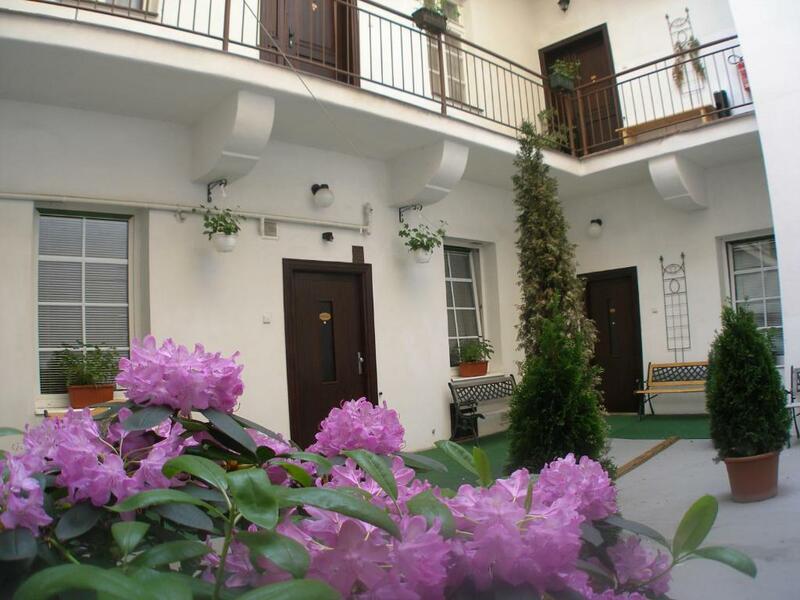 Offering spacious rooms and apartments facing the peaceful inner courtyard and with free Wi-Fi, Aparthotel Davids provides a free common PC, baggage storage and safes at the reception. Situated on the border between Prague's historic quarter and the newer part, it is close to Petrske Namesti Square and St. Peter's Church. The shopping centers Palladium and Kotva are within 1,000 feet from the Davids and the line B/C metro station Florenc is 1,650 feet from the Aparthotel. Laundry services are available at the Aparthotel Davids. 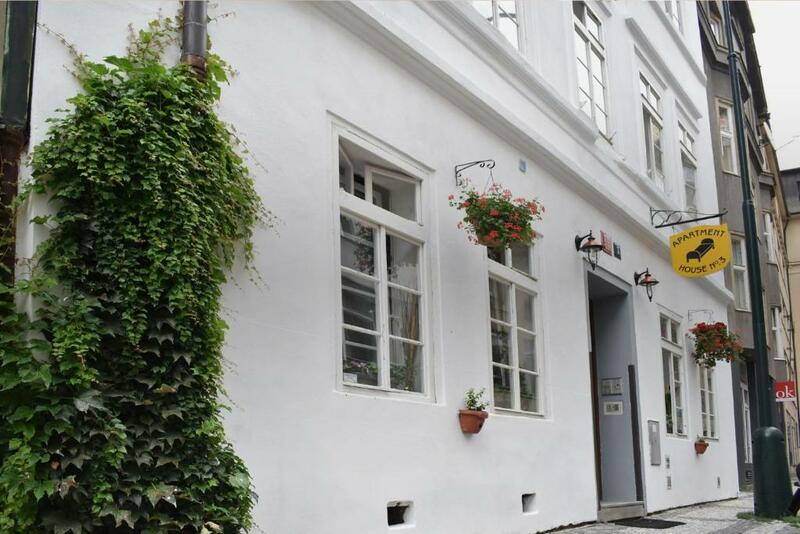 뀐 Located in the real heart of Prague, this property has an excellent location score of 9.2! When would you like to stay at Aparthotel Davids? This is a room in a 3-bedroom apartment, sharing a bathroom as well as a kitchen with 2 other rooms. Please note that children under the age of 3 are not allowed to occupy rooms with shared bathrooms. This apartment consists of a bedroom with 3 beds and a kitchenette with sofa bed. Please note that the room rate is based on 4 guests. Maximum occupancy is 5 guests (see extra bed rates). This room has a private bathroom. Guests have access to the kitchenette, which is shared between 4 rooms. Please note that the apartment rate is based on 2 guests. Maximum occupancy is 3 guests (see extra bed rates). This is a room in a 3-bedroom apartment, sharing a bathroom as well as a kitchenette with 2 other rooms. Please note that children of age 3 and younger cannot be accommodated in the rooms with shared bathroom. Náš apartmánový hotel je specifický svým umístěním v historické pavlačové budově, staré přes 200 let. Ačkoli jsme v samém centru Prahy, překvapíme vás naším tichým a klidným okolím, kterému "vévodí" kostel sv. Petra. Jsme malá rodinná firma a poskytování ubytovacích služeb se věnujeme již přes 15 let. Stále je co zlepšovat, ale naše práce nás baví i těší. Jsme šťastní, když se k nám naši hosté rádi vrací, ale ceníme si i každé vaší připomínky jak být ještě lepší. 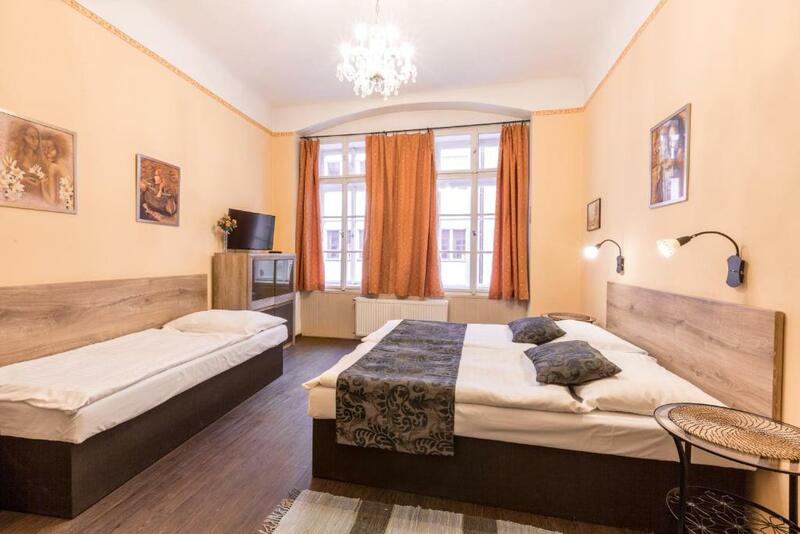 Ačkoli se náš apartmánový hotel nachází přímo v centru Prahy, jeho bezprostřední okoli je tiché a velmi klidné. V blízké dostupnosti je nepřeberné množství kaváren a restaurací, výborné nákupní možnosti nabízí Palladium a Kotva. Area Info – This neighborhood is a great choice for travelers interested in history, architecture and culture – Check location Excellent location – show map Guests loved walking around the neighborhood! House Rules Aparthotel Davids takes special requests – add in the next step! Aparthotel Davids accepts these cards and reserves the right to temporarily hold an amount prior to arrival. Please note, check-in after 21:00 needs to be announced to Aparthotel Davids prior to arrival. Please inform Aparthotel Davids of your expected arrival time in advance. You can use the Special Requests box when booking, or contact the property directly using the contact details in your confirmation. Breakfast was nice. Coffee prepared. Breakfast room is a little bit small, but ok Receiption was very quick. The room was clean, i have slept nice. The shared shower was very clean and the had even a microwave in a shared kitchen which i havn't used. No heating in the apartment. Kitchen was badly equipped. The check out timing and waiting to check in. Everything was great. The staff, location, breakfast. Loved our stay. We stayed just one night but everything was fine. Cozy room, balcony, kitchen, even shared bathroom (it was shared with another room, not with all rooms on the floor) was clean and nice. Stuff was friendly, location is good, close to the center. It was in a very nice place and a nice building. Very helpfull staff. Actually they saved me when I was left on the street without any place to stay because of my other reservation. It is very very nice building and comfortable, I wish I had more time so I could stay there longer. Great Staff. Great attention to customer. Very friendly and ready to advise on where abouts in the city. The key system makes to overhear the neighbours when they go to the bathroom or they enter to the room. if they go out until later even if they are not noisy the constant sound of the locker opening and closing doors can be a bit disturbing. I loved the cleaness, big rooms with kitchen, amability from the staff, and the lovely placement. I only had to share bathroom with one more person. There was a kitchen and it was convenient. Quiet place and good breakfast!!! A communal lounge. I don't think I saw anyone else staying in the building the whole 5 days I was there. Would be nice to socialise more. 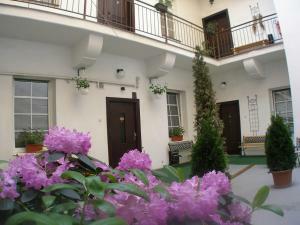 Location great - 10 minutes from Old Town Square. Very clean and tidy. Was expecting to share a kitchen but found a kitchenette in the room - great! Bathroom very modern, very clean and well supplied, even with shower/hair gel and hand gel. Breakfast excellent - lots of choice.